Thanks to everyone who’s sponsored Stop/Eject so far, and also to everyone who’s shared and forwarded the call for sponsors. It’s been a great start to the crowd funding campaign. The BBC’s Flog It! programme came to Hereford Cathedral yesterday, and since they were looking for stewards I decided to sign up. I’ve been a filmmaker for twelve years but I have almost no experience of broadcast TV, so this was a good opportunity to dip my toe into a different section of the industry. If, like me, you’ve never seen Flog It! it seems to be exactly the same as Antiques Roadshow only they take your stuff to an auction at the end and sell it. Yesterday was a valuation day, meaning members of the public show up with the tat from their attic and a few will discover they were sitting on a nice little nest egg. Any items whose owners wished them to be sold would then be packaged up and sent off to auction at a later date. Filming was meant to begin at 9am with shots of the huge crowd waiting outside, but only about fifteen Herefordians had shown up so things were delayed for a while as we waited for people to get up. It actually wasn’t long before the queue was quite impressive – almost as impressive as the jib which was being used to film it and the speed with which this jib’s two man crew could move it and set it up. At this point my job was to stop passers-by from wandering into shot. The very first person I stopped and asked to walk around the back of the jib turned out to be one of the presenters – well done, Neil. When the doors opened, us stewards had to lead the throng into an elaborate snaking queue which, at its peak, would represent a three hour wait for the dollar-eyed hopefuls. Once that was up and running, my job was to stand at the door and ask people entering if they were here for Flog It! (since the cathedral was still open to the public as normal) and if they were then to hand them an information sheet and apologetically point them towards the very back of the queue. It made me weep for the soul of humanity how many people were dull-witted enough to answer the question “Are you here for Flog It?” with “How much can I get for my wife?” Anyway, this job wasn’t very demanding and I was able to observe the shooting MO. The crew had obviously done this many times and they had their system down pat. The front part of the queue formed a horseshoe around three sides of the main open space which was evenly lit with four 1.2K HMIs bounced off large polyboards. (Flog It! banners hid all the stands from the cameras.) This area was treated like a three-walled studio set. The cameras always stayed at the “fourth wall” end, where two or three kinoflos provided extra kick for the foreground tables. 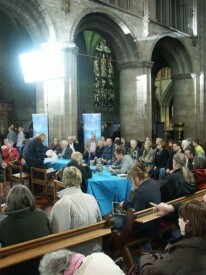 At these tables the show’s resident experts were filmed discussing items with their owners. 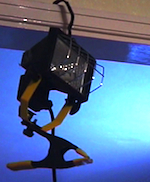 This meant no re-lighting, apart from a bit of moveable fill which was provided by handheld or camera-mounted LED lights. In the background, two further 1.2K HMIs were angled up at the roof and attractive gubbins of probable religious significance around the altar. Job’s a good ‘un. I was surprised at the number of cameras in use – five or six split into three units each with its own director and support crew. 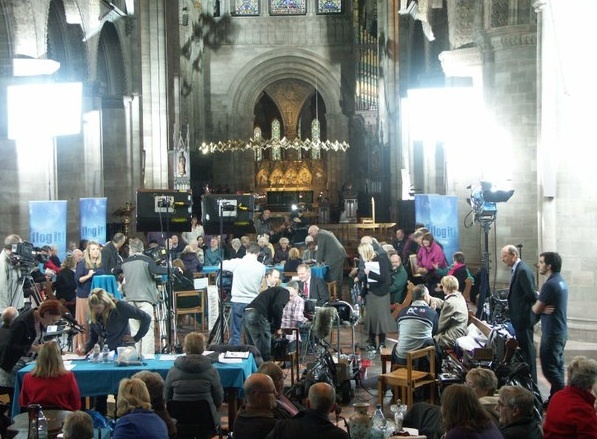 Two units were constantly shooting valuations at the aforementioned tables, while the third was at the other end of the cathedral shooting other valuations which had been picked out by the production team as particularly interesting. At lunchtime I got a bit of a shock by how civilised the arrangements were. On low budget films I’m used to half a slice of pizza out the back of someone’s car, but this being a BBC production we were treated to hot cottage pie with steamed veg and bread at proper tables with real plates and cutlery and nicely folded napkins. At 4:15pm we derigged in the cathedral to make way for evensong and moved everything into the narrow museum area leading to the Mappa Mundi exhibit and Chained Library. 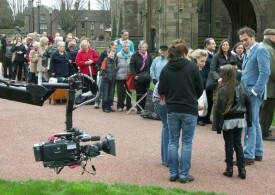 Here several more valuations were filmed and I was called upon to sit in the background of shot to fill up the frame. I was also put on tea and coffee duty around this time. To deliver the drinks to the unit at the back of the museum area I first had to get past the other two units, which involved a wait of several minutes at each one for a break in recording, like city traffic lights. Filming wrapped a little after 6pm and after helping carry stuff back to the vans and put the cathedral’s furniture back where it had come from I bade goodnight to all and sundry and headed home. Get the tea and coffee orders right. Write it all down, including names, and then transfer that info to the polystyrene cup when you’re making the drinks so they’re easy to distribute. If there’s any chocolate around distribute that too. It’s always good for people to associate you with receiving tasty snacks. Your tasks will invariably be boring but complaining about this is a definite no-no. Make use of the time to observe what the crew are doing – but not to the detriment of carrying out your task. Make sure you’re projecting “keen and eager” at all times. Don’t dawdle eating your lunch and get back to the action as soon as your plate’s clear. If you have to walk in front of a camera (not while it’s rolling of course) remember to say “crossing” as a courtesy to the camera op. If there’s an opportunity to stay a bit later than most other people and help load those last few cases into the van when everyone’s knackered, do it and you’ll be remembered with warm feelings. Our crowd-funding campaign has launched today. 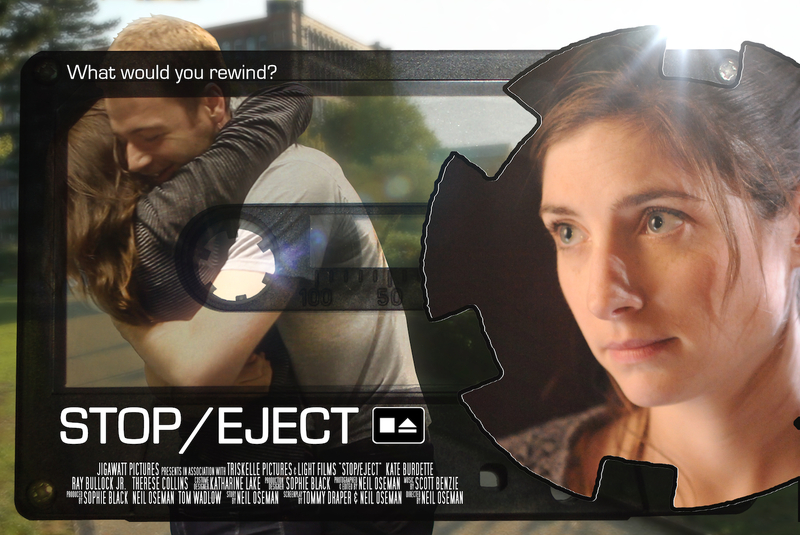 We need your help to bring Stop/Eject, a heartbreaking story of love and loss, to the screen. Donate as little or as much as you’re able, and don’t forget to tell all your friends to do the same. You can link to our Crowdfunder page or you can embed the widget (see sidebar on right) on your own site. Although Light Films have kindly funded the development and initial pre-production, we still need money to buy more props, costumes and materials for the set, and to cover travel, catering and accommodation. For those of you who have been following my filmmaking exploits online for a while, this is your chance to get personally involved. Everyone who donates will get a thank you in the credits, plus there are various great rewards available if you donate over certain amounts, such as exclusive posters, signed artwork and DVDs of my films, some of which have never been available to own before. Still not convinced? Check out my previous Stop/Eject blog posts to read about all the hard work that’s already gone into this project. I believe this film will be something really special, but I can’t make it without your help. Sponsor it here. Thanks everyone! Stop/Eject is back with a vengeance. Light Films is now taking a back seat in the production, but production designer Sophie Black has come on board as a producer and we’ll be launching our crowd-funding campaign any day now. Watch this space for your chance to get involved and help make it happen! Col recently put me on to this fascinating blog by DP Shane Hurlbut. His most recent post looks at how he lit eight city blocks in Puerto Rico using minimal equipment. This was possible due to the low-light capabilities of modern DSLRs and high-end HD cameras. Apart from a couple of rented HMIs lighting background buildings, his gear mostly came from Home Depot (America’s equivalent of B&Q). I remember arriving in upstate New York in 2002 to begin shooting Tom Muschamp’s first feature Beyond Recognition and being horrified by the suggestion from someone on the production team that I could get all the lighting kit I needed from Home Depot. That was a Mini-DV shoot and I did eventually get provided with some Arri lamps, but it just goes to show how times have changed. Crucially what Shane’s blog illustrates is that even if you’re going with existing light sources, your job as DP is not over. You still have to mould them using flags, gels, black wrap or whatever. Just because you can physically expose a picture, that doesn’t mean it’s “lit” in the artistic sense of the word. Open University programming isn’t what it used to be. Gone are the men with tweed jackets and unfathomable beards who haunt your TV screen at 3am. In their place are men with no chins and terrible haircuts who loiter on YouTube 24/7. Following on from my last post, let’s take a closer look at how part of The Beacon‘s car chase sequence was created, in particular the bit where Sarah goes flying out through her windscreen during the crash and miraculously lands on the roof rack of the villain’s speeding car. This ridiculous feat garnered a round of applause at the premiere, but how was it done? The car crash was done for real, as previously explained, but clearly I couldn’t afford the stunt team and wire rigs necessary to catapult someone through the air and then composite in the vehicles below, which is how you would probably do it if you had a proper budget. In fact there are no visual FX in this sequence at all. 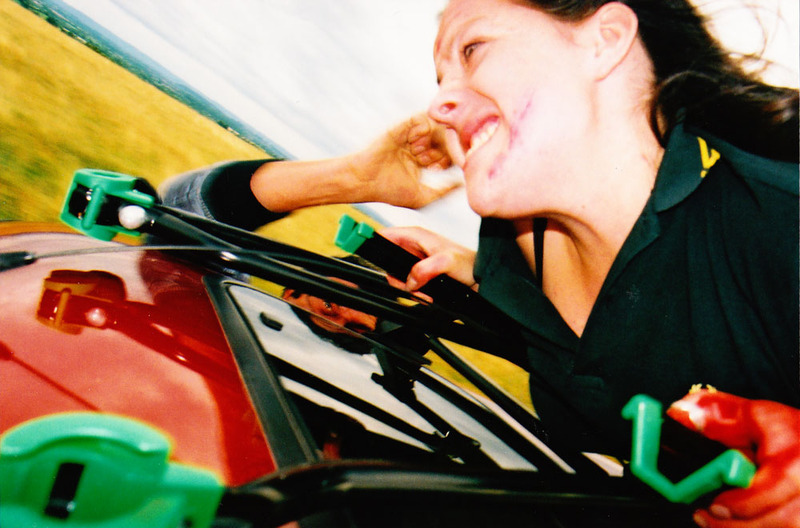 The illusion is created entirely through editing, using quick cuts of Sarah (LJ Hamer) leaning through the pre-smashed windscreen, a close-up of her legs being pulled out through the windscreen by a couple of crew members stood on the bonnet, a low angle shot against sky where she’s not moving at all, and a dummy being thrown at the villain’s car. The dummy was pulled together from whatever items we had to hand and looked terrible, but only eight frames of it were needed in the edit before cutting to an angle of LJ (already on the roof rack) dropping from all fours onto her front. They say a picture is worth a thousand words, so a video must be worth at least a million. So I’ve put together a little compilation of the rushes so you can see exactly what I mean.